Having spent so much time travelling and living overseas, I was bound to pick up influences from the radio and television wherever I was. A number of these broadcasters are now defunct, but here's a look at what I've enjoyed hearing and seeing the most in the UK and USA over the years. My first American radio experience was actually via Sydney radio. Casey Kasem's American Top 40 was broadcast every Sunday afternoon on 2UW in the mid to late '70s and I was rivetted by the sounds of songs that were already hits in the States. I first heard Queen's "Killer Queen," The O'Jays' "I Love Music," Starland Vocal Band's "Afternoon Delight" and Andrea True Connection's "More More More" on AT40. I also heard Boz Scaggs, Candi Staton and The Manhattans there first. Bee Gees songs such as "Fanny Be Tender" and "Nights On Broadway" were hits in the States well before Australia so I already knew them word for word when they finally hit the Sydney airwaves, and I delighted in boasting to my friends about other music they still hadn't heard of. I don't think my friends actually cared, but I got a real buzz from being in the know. Casey Kasem is a legend in American broadcasting and American Top 40 has had several incarnations. It lives on to this day with Ryan Seacrest counting down songs I have mostly never heard of and really don't want to. If you were listening to AT40 back in the '70s when pop music was actually good, you might want to check out some of the fascinating and detailed sites on the web. I have lived in London on several occasions. The most formative of those times was a six-month period in 1980, fresh out of high school and still very much a 2SM obsessive. I was eager to find a London radio station that could engross me in the same way, and there was Capital Radio  194 metres medium wave and 95.8 stereo VHF. Totally naff, and they never would have gotten away with it on 2SM, but it seemed wholly appropriate on Capital. And how I loved to go into the big Capital headquarters in Euston Tower, at the bottom of Tottenham Court Road, and peruse the Capital shop. Stickers, mugs, sweatshirts, t-shirts... It was an active radio listener's paradise! My London friends thought I was a bit of a nutter, but I was having fun. The one-of-a-kind Kenny Everett spent some years at Capital and I was lucky to hear the tail end of his infamous time there. Kenny was a legend in his own airtime - both on radio and television - but I guess if you had to compare him to an Australian jock, he was probably like a gay Doug Mulray on speed. 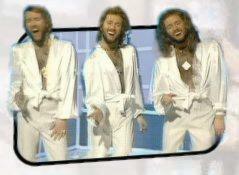 Not that Doug ever had the balls to do a Bee Gees impersonation, of course. God bless Kenny. There are two great Kenny Everett websites worth visiting. Tim Longhurst's extraordinarily beautiful Kenny Everett site has to be your first port of call. You can click on the Kenny Gees at right to go there, also. Looking glamorous in 1982 On successive visits to London during the 1980s I continued to be faithful to Capital. When I decided to spend the rest of my life in London and moved over "permanently" (it lasted two years) in 1990, I found a very changed Capital. It had split into two stations  Capital Gold, still on 1548 on the AM band, playing classic hits, and the new Capital FM which focused on contemporary pop. It goes without saying which one was more my cup of tea. I always loved the late great Alan Freeman's "Pick of the Pops" shows that looked back at a week on the charts back in 1970-something. And I particularly liked Martin Buchanan's "70s Hit List," a late night competition which I called in to play once and dismally flunked, despite questions on Sherbet and John Paul Young. I don't think I have ever lived down the shame. Thinking about it, that's probably why I didn't stay permanently in London after all. There used to be a great History of Capital page on its parent company's website but alas, it no longer exists. If you spent time in London in the 1970s and 1980s and have fond memories of Capital Radio, you might want to check out the Wikipedia's Capital Radio page, which is a good start. 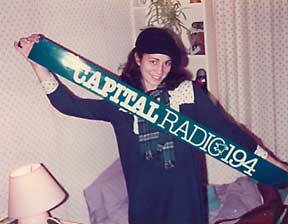 Then you should head right over to the Vintage Broadcasting site, where there is a really fantastic history of Capital with sound clips of the jocks and station promos, playlists, promo material and more. After several months in London in 1990 I realised that most of the standard music radio was no longer to my liking and I discovered Greater London Radio  GLR. It was intelligent, newsy and varied, with good music (I remember a lot of Dionne Warwick) and eclectic announcers, such as the mad Chris Morris on Sunday mornings, who had himself suspended from the station for being a naughty DJ. Have a listen to one of his traffic reports to get an idea of his style, then head over to his weird and wonderful cook'd and bomb'd website to hear lots clips from his GLR days. GLR changed into BBC London Radio some time later in the 1990s and I have no idea what it's like these days but you can click on the logo above to find out some more. Meanwhile in the 21st century, radio nostalgia is a live and well in the hands of people like Tony James, who's a busy guy. You can hear his Goldmine radio show on his website and find out about all the other radio he's involved in. From 1992 my overseas travelling was American-oriented and so new radio horizons had to be explored. In Los Angeles I discovered Arrow 93FM and it made me very happy! Here was a classic rock station that played the music I loved the most. Lots of the usual suspects  Eagles, Doobie Brothers, Jackson Browne et al. But also A LOT of Chicago, mainly due to morning DJ Mary Price (pronounced Merry Price) who was an unashamed Chicago fan  god bless her! Arrow 93 concert Arrow always had loads of competitions and promotions going on, as the radio market in LA is extra competitive and keeping loyal listeners is a mammoth challenge. They would also present concerts at large public events, and bring out old rockers like Eddie Money, who no-one in Australia has really thought about since the late 1970s. It was nice to know that there was a radio station out there that really cares about those old guys! In 1997 I managed to befriend one of Arrow's promotions guys, Darren, who was on duty at the Arrow stand at the Taste of Newport fair. Darren sent me some Arrow goodies and invited me for a tour of the Arrow offices and studios. In 1998 I had a nice visit with Program Director Tommy Edwards, who had a listen to one of my Debbie Does Breakfast tapes and commented that he enjoyed the dog dedication segment. I also hung out for a while with Mary Price in the studio and raved about Chicago with her. Cool, hey? As an active listener who always prefers to keep my radio tuned into one frequency, I enjoyed Arrow's reliability in its programming and the enthusiasm of its announcers. 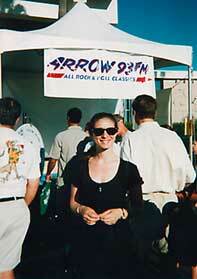 Alas, the station was changed in 2005 from Arrow and its classic hits format to something called Jack FM. Bummer. Having said how loyal I was to Arrow, I have to qualify by saying that I think KLOS was and is probably a better station. Although the music can be a bit heavy for my tastes at times, it has a more diverse line-up of on air personalities and the funniest breakfast radio show I have heard since Ian MacRae on 2SM in the 1970s. In 1998 in LA, I caught the Mark & Brian bug. I had never heard a radio show like theirs, and was soon completely hooked. They defy description. For one thing, they don't actually play music. Not in the conventional sense. They play short clips and occasionally have an artist perform in the studio. But for the main part they talk. For four and a half hours every weekday morning, Mark and Brian talk. And they are hilarious. Click on their photo to go straight to their page on the KLOS site. Mark & Brian's interplay with their audience is remarkable. A simple phone call from a listener can turn into a running gag for the entire morning. Their phone-in competitions, such as "You Can't Win," are a hoot. Their "Miniature Theatre" is incomprehensible. And their "Naughty Slutty Confessions" segment, which I used to listen to on a Friday morning in the car from 9am, had my jaw dropped so low it was hitting the accelerator of my car. Oh, and Mark & Brian are huge Chicago fans. They've had Chicago play at their annual Christmas Show a couple of times, and their live in-studio interviews with them have been really fun. Artists seem to love doing the Mark & Brian show. Actor Ed Harris has been on several times, and memorable interviews I've heard include Rick Springfield, John Fogerty and David Crosby. Their show used to be worth moving to LA for  now you can listen live online. Just go to the Mark & Brian site. 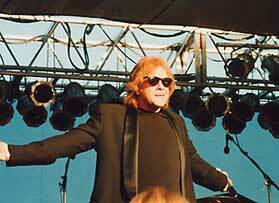 Photo courtesy KLOS Then there's the living legend Jim Ladd, one of my all-time radio heros. Jim Ladd is one of the most knowledgable, smooth, laid back jocks who ever existed. He is the master of the "Innerview", the first FM rock interview show. He is also just about the only DJ on a high rating commercial radio station anywhere in the world who is playing free form. Meaning, he programs his own show as it pleases him each night. And his tastes are generally pretty cool. Click on his photo to find out more. KLOS has a great website from which you can hear them broadcasting live and check out their promotions, competitions, on air personalities and more. It's the next best thing to being there. Click on the new logo to go to the KLOS website and find out all about it. I just loved VH1. In the '90s it was the best music television channel in the world. If you click on the old logo below, it will take you to VH1's main website, which bears almost no resemblance to the VH1 site that existed when I first created this webpage. VH1 today (2009) is virtually indistinguishable from MTV. Not good. Way back when... VH1 was an offshoot of MTV in the United States. It was started as an alternative to the increasingly youth-oriented VH1, to cater for the adult sector of music fans, serving up hefty doses of classic rock specials, while still screening contemporary rock and pop clips by more adult-oriented artists. Fortunately that original appeal of VH1 has managed to survive on VH1 Classic, one of the several branches of what has become a VH1 network. You can find out more about VH1 Classic by clicking the logo on the right. VH1 had a plethora of programming, but their most renowned and beloved series was Behind The Music. An artist or band really knew they'd made it in music if VH1 wants to do a Behind The Music about them. Many of my favourite artists were Behind The Music-ed. Chicago, Doobie Brothers, David Crosby, Fleetwood Mac, Bonnie Raitt, Harry Chapin, Heart, Rick Springfield and the Mamas and Papas are some of my favourites. I've also enjoyed Behind The Musics on Duran Duran, Weird Al Yankovic, Leif Garrett, Madonna, Cher, Boy George, Peter Frampton, Andy Gibb, Donny & Marie, Woodstock, the Go Gos, Sonny Bono, Meat Loaf and Lionel Richie. Heck, they even made Motley Crue and Ted Nugent interesting!! I have a wonderful collection of Behind The Music programs on good old VHS, most recorded during times spent in LA, but also thanks to friends in the States kindly recording them for me at other times. I'm not sure if VH1 is airing the old Behind The Music specials these days, but it's worth catching them if you can.